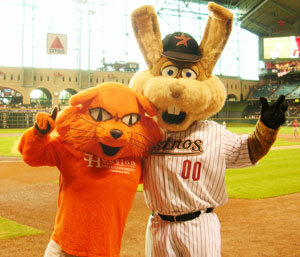 Sammy the Bearkat with Junction Jack, the Astros mascot, during the 2006 Night at Minute Maid Park. SHSU students, faculty, staff, alumni and friends of the university will all receive discounted rates when the Houston Astros take on the Texas Rangers during the Alumni Association’s Sam Houston State University Night at Minute Maid Park. The June 24 game will begin at 7:05 p.m.
Food and drinks will be served at a pre-game reception, catered by Irma's Southwest Grill, just two blocks from the stadium. The reception will begin at 5:30 p.m., according to Alumni Relations director Charlie Vienne. The association will provide chartered transportation to the game departing from Bowers Stadium at 4 p.m.
A total trip package including transportation, the reception and game ticket is $75. Club-level game seating and a pre-game reception are also available through the association for $60 per person. To make reservations for the chartered bus or club-level seating and pre-game reception, call 800.283.7478 or visit http://ww2.shsu.edu/alum02wp/. The reservation deadline for the charter bus and for tickets is June 17. Guest speaker Emmanuel Amamoo-Otchere will discuss "Strengthening Spatial Planning in Ghana: Implementing Sustainable Cities and Climate Change Adaptation Land Use Management Strategies" on Tuesday (June 3). The event, sponsored by the geography department, will be held from 11-11:50 a.m. in Lee Drain Building Room 207. Amamoo-Otchere is the executive director for the Center for Remote Sensing and Geographic Information Services at the University of Ghana in Legon, Ghana, as well as a visiting Fulbright Scholar at Alcorn State University in Lorman, Miss. The native Ghanaian holds a number of degrees in geography, rural survey and land ecology from universities in Ghana, The Netherlands and France. He has served as a consultant or project adviser in geography-related fields for the European Union and other world-wide organizations. For more information, call the geography department at 936.294.1451. 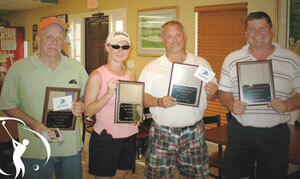 Golf tournament winners included (first flight: top, from left) Dean Lewis, Jim Bexley, Rich Ballinger and Charlie Vienne, and (second flight: bottom, from left) Rodney Conwell, Kelly Benge, Glenn Green and Mike Yargo. Three “business” men and the director of Alumni Relations were a cut above the rest during the Recreational Sports department’s 14th annual Faculty/Staff Golf Tournament on May 21. 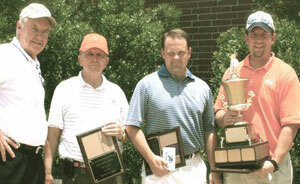 The team of Rich Ballinger, Dean Lewis, Charlie Vienne and Jim Bexley received the coveted “competitive traveling trophy” as first flight winners, and the team of Rodney Conwell, Mike Yargo, Kelly Benge and Glenn Green won the second flight. Other tournament contest winners included Terry Thibodeaux, putting; Dean Lewis, first flight closest to the pin; Jason Hooten, longest drive; Cindy Allbright, women’s closest to the pin; Denise Holcomb, women’s longest drive; and Trevor Thorn, second flight longest drive. Huntsville-area children entering the first through sixth grades will have the opportunity to “clean up a polluted environment, build extravagant new art displays and explore the planet Mars – all in one week” during Camp Invention. The five day camp, held on the SHSU campus July 28-Aug. 1, allows students “to learn in a hands-on, inquiry-based environment,” according to SHSU Camp Invention director Mary Gedelian. Since 1990, the program has provided nationally-acclaimed curriculum and enriched learning opportunities on a local level. The program utilizes local teachers and staff members that makes each experience unique to the area and allows children and parents to feel comfortable, Gedelian said. “Recess Remix” allows children “to take their ideas from imagination to real-world application” through the creation of their own games and activities. The cost of the camp is $235, or $210 for children of SHSU employees, which includes all programming, supplies, daily snacks and a T-shirt. Twenty-five dollar discount coupons are available on a first-come basis. For more information on the Camp Invention program, visit www.campinvention.org or call 936.295.6935. The Student Advising and Mentoring Center will teach students how to “study smart” with its summer edition of its Study Skills Workshop series beginning June 2. The four, one-hour sessions will introduce study skills, as well as discuss procrastination, time management, reading textbooks, test-taking strategies and stress management. Sessions will be held at a variety of times on Mondays, Tuesdays, Wednesdays and Fridays to accommodate student schedules. The world is populated by approximately 58,000 species of vertebates, and area students from 7 to 14 years of age will have the opportunity this summer to learn a lot more about them. The Sam Houston State University Vertebrate Museum is offering the natural history classes to introduce the students to local animals and their habitats. Under the direction of William Lutterschmidt, the activities will include field trips to sites in Huntsville and Walker County, including a number of different ecosystems. "We will visit places like Lake Raven and the Huntsville State Park, the Sam Houston National Forest, and the Center for Biological Field Studies of Sam Houston State University's Department of Biological Sciences," said Lutterschmidt. "Students will gain experience in the outdoors, learn to identify vertebrate species, and recognize the importance of conserving and appreciating local ecosystems," he said. Three classes are offered both weeks of June 9-13 and June 16-20. Times are 9 a.m. to noon, 1 p.m. to 4 p.m., and "Nature at Night" from 8 p.m. to 10 p.m. Enrollment is limited to 12 students per class. Registration fee is $80 per student. Contact Lutterschmidt at 936.294.1556 for information or a registration form. The Public Relations Office is currently accepting information to be used in its calendar pages for the summer and fall semester. Departmental or organization calendars or events may be sent to today@sam.edu or jenniferg@shsu.edu or by fax to 936.294.1834. "Solar Forecast: Storm Ahead," which appeared in the July 2007 issue of Sky & Telescope magazine, was selected by the Solar Physics Division of the American Astronomical Society as the winner of a SPD Popular Writing Award. As the winner, James was awarded $500 and a certificate during the SPD members’ meeting during the 2008 Joint Assembly of the American Geophysical Union in Ft. Lauderdale, Fla., on May 27. The Solar Physics Division of the American Astronomical Society holds an annual competition to recognize two outstanding popular articles on the sun or its effects on the Earth's environment. James’ article won the “scientist-author” category. “The purpose of the awards is to encourage scientists, science writers, and journalists to write about the Sun and thereby educate and excite the public about solar research,” said J. Todd Hoeksema, Solar Physics Division chair. Selection is based on relevance of the article to solar astronomy or solar physics, or space physics directly associated with the Sun; educational value; accuracy in describing the scientific issues involved; clarity of presentation; and number of readers who would likely have seen the article. Four students were recently awarded $1,000 from the foreign languages department. The 2008 scholarship recipients include French minor Jennah Burleson, who received the Foreign Languages scholarship; Spanish majors Emily Resnick and Marie Kellog, who both received the Mozzelle Powell scholarship; and Spanish major Erin Irvin, who received the Sophie Barat scholarship. For more information, contact foreign languages scholarships and grants committee chair Joaquín J. Rodríguez-Barberá at 936.294.1440 or the foreign languages office at 936.294.1441. Huntsville High School students have spent the semester taking “the next step” by getting acquainted with the college life as part of a mentoring program coordinated through SHSU’s Student Advising and Mentoring Center. For the third consecutive year, SHSU students have worked to “Close the Gap” in education by acting as mentors for Hispanic HHS students through El Siguiente Paso (the Next Step), an eight-week program designed to “provide under-represented, first-generation high school students with information and preparation so that they can continue their education after high school,” according to Margaret Ferguson, SAM Center staff associate and mentoring program coordinator. Through the program, students tour the campus, visiting admissions, the Testing Center and eat lunch at Café Belvin, as well as receive career assessments and information on financial aid, study skills and pre-admissions tests. “All of the activities take place in the context of meaningful relationship with a successful Sam Houston student as mentor and role model,” Ferguson said. Spring mentors included Edgard Sanchez, Da'Rel Johnson, Ashley Smith, Jamal Turner, Steven Reynolds, Chris Robbins, Deborah Hendrix, Shellsy Malveaux, Evelyn Vasquez, Melissa Ridgway, Marisol Salgado, Carla Miranda, Nicole Gonzalez, Megan Konarik, Paz Medina and Sonia Gonzalez. The SAM Center is currently seeking mentors for the fall program. To participate in El Siguiente Paso, mentors are required to have a minimum 2.5 grade point average, and “must have a real interest in helping high school students learn about the college experience and what it really takes to get into college and stay there,” Ferguson said. For more information, contact Ferguson at mxf001@shsu.edu.